For most newbies or to-be hobbyists of drone/aircraft model, propellers are prone to break in plane crashes. So, how to pick or choose the right props would be quite important. But, also not that easy for green hands. Well, actually there are some tips in selecting the most suitable props (yes, there's no definitely perfect props!!) for your aircrafts. First you need to know, what's your preferred effect? Steady, agile, or crazy flight? Also take into account the diagonal motors distance, motor power, etc. when choosing. So if you want higher power, you can use longer props like 6-inch ones, but the agility would be sacrificed. 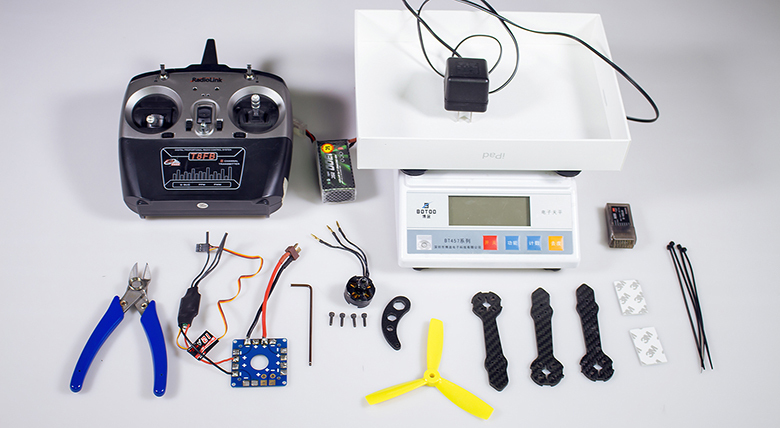 For example, to install an FPV camera on, you need the power. How the prop looks like will also determine its thrust - in the shape of bull nose (BN), hybrid BN (HBN), and pointy nose. Thrust: HBN>BN>pointy nose. Also the number of blades can affect the power: 2-blade, 3-blade, 4-blade, etc. ; the more blades, the higher power. After knowing these determinants, you may still be confused. So let the facts speak for themselves. I'll show you how to use a scale to test the thrust of props. 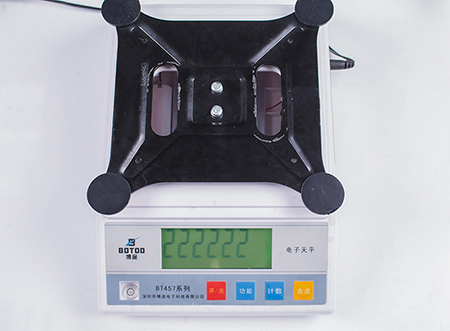 Usually the weighing tray can be uninstalled easily. Just gently take it away. Below, there are slots and a hollow space underneath. We'll fix the motor by tying through these slots. 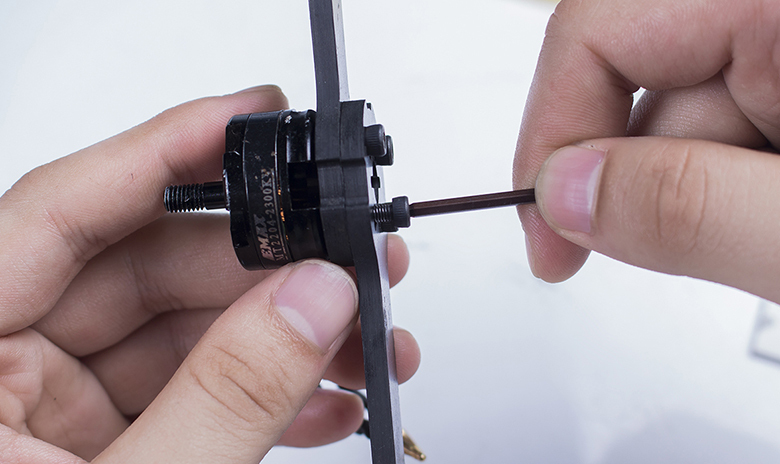 Remove the bullet cap on the motor with the prop removal wrench. Assemble two frame arms, align their holes to those on the motor, insert the screws into the holes, and screw them tight with the L-shape screwdriver. Cut the 3M tape into approx. 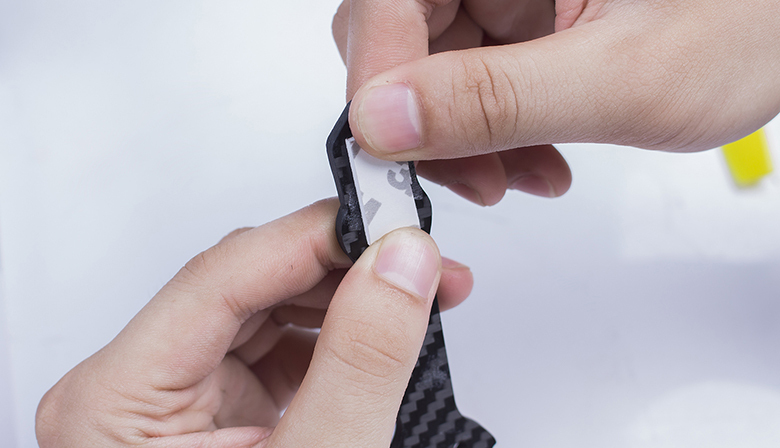 size to the arm width, stick the tape onto the arm after placing the arm onto the scale to check the sticking position. Then peel off the sheet on the tape, stick the frame arms to the scale - one directly on it, one of the combined part onto the arm already stuck, and the last arm to the other side of the scale. Fix them with wire ties - better across 4 directions centering the joint. Place the prop onto the motor, and fix it with the bullet cap. Spin the cap tight with the wrench. Pay attention to place the prop correctly - the motor used is a CCW one, so the prop used also rotates counterclockwise. First thread the three wires of the ESC (electronic speed control, the other end already soldered to the section board with 2 power wires) through the hollow between the scale body and top frame, connect them with those of the motor. Note: The connection can be done randomly now; later we'll come back to exchange if necessary. 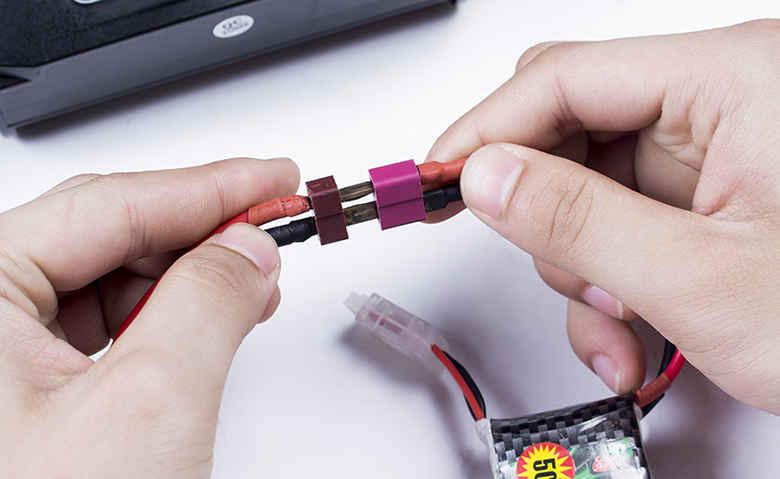 Then plug the three-pin wire of the ESC to the first channel of the receiver (roll here; any channel is OK except throttle since it won't spring back to center automatically). Power on the radio transmitter now. 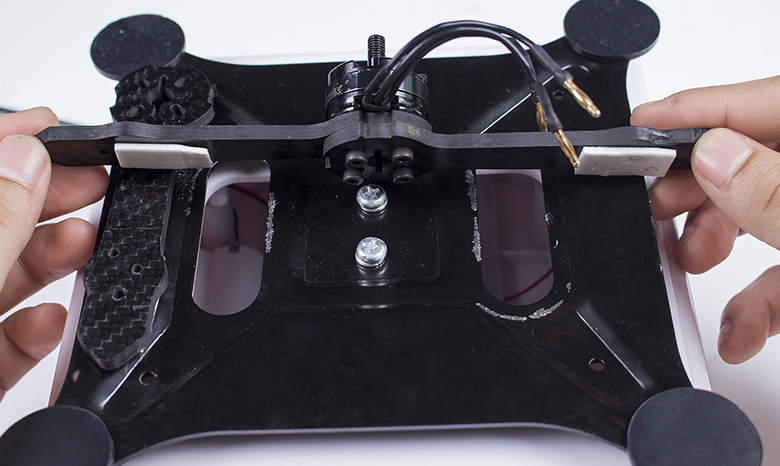 Calibrate its pairing with the receiver: pull the rudder (roll) slowly to the largest, hear a beep, pull the stick to the minimum quickly, then hear a short piece of music, and the calibration is done. Power off the transmitter. 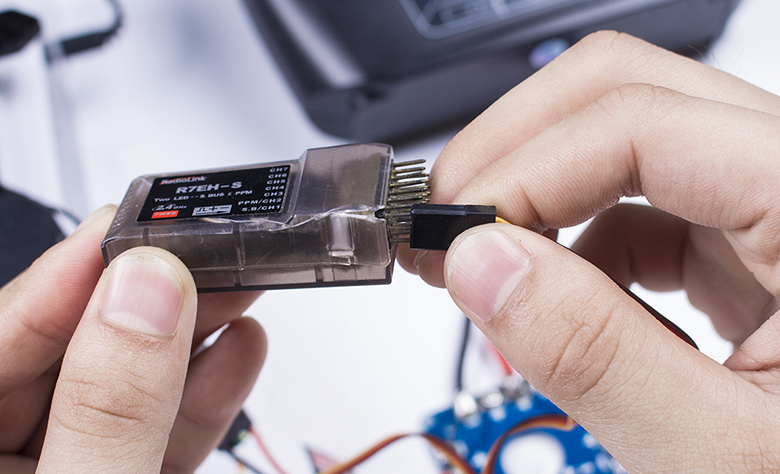 At last, connect the power - power distribution board wire and battery wire, red to red and black to black. Press the button of peeling off. Now power on the transmitter again. 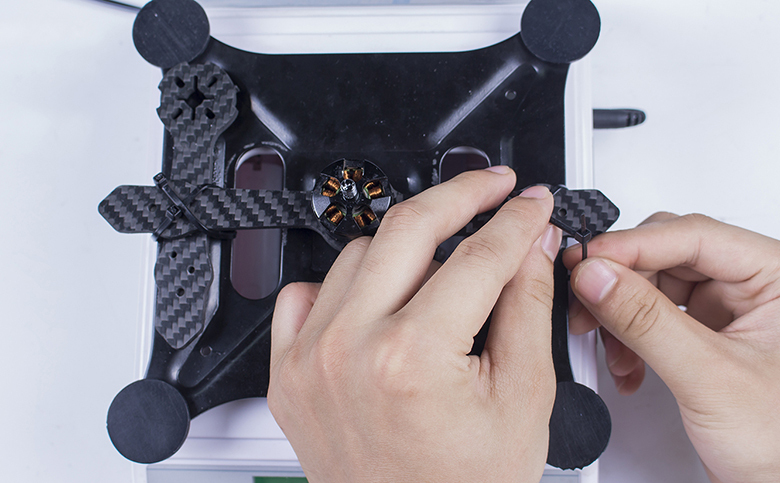 Note: If the prop spins clockwise which is reversed, try to exchange any two wires of the three of the ESC to those of the motor, till the prop spin counterclockwise as it should do. Pull the rudder stick to the top. The value measured by the scale should be a negative one. Note down the number when it reaches steady. Change the prop you'd like to test and mark down another value. In the end, you have the data telling which one meets your needs best. So you got it!